I last visited Barcelona more than twenty years ago. 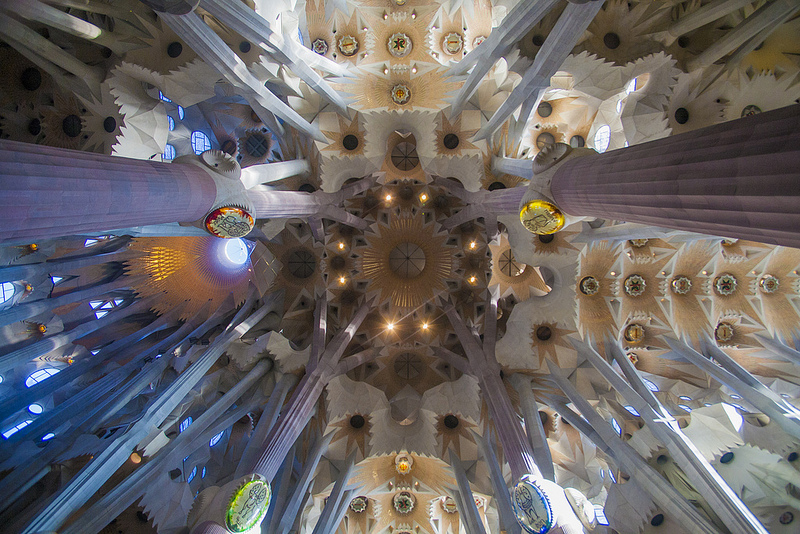 Back then the Sagrada Família was already impressive, but also incomplete. All that stood were the nativity façade and some small number (four? eight?) of the Sagrada’s eventual eighteen towers. I recall nothing of the interior, perhaps because there was none. In many ways, in fact, it resembled a ruin: something not all there. This time was different. The church, our guide told us, was about a third complete the last time we were there, and is a bit more than two thirds complete now. Still remaining are some new towers and detail work on the exterior, a proper floor for the interior (it’s mostly temporary marble now), and the final entrance: the glory façade at the south end, or the foot of the church’s cross. Impressive and iconic as the exterior is, the interior achieves a magnificence which, to me, exceeds not only every other church I’ve seen, but every building, period. The forest of columns, which really do resemble trees, spread above oval “knots” into branches that hold up the roof the way spread out fingers might hold up a dish from below. In fact they do far more than that: they are also made to carry the weight of the Jesus tower, which will rise to five hundred and sixty feet above the ground, ranking the Sagrada as the tallest church on Earth. And, rather than leaves, the ceiling features beautiful pores — the navels of hyperbolas — that suggest portals toward the infinite. That’s one view, above. More can be found in this photo set. The captions aren’t right yet, but the connection at our B&B here is awful, so writing — even a blog post like this — is a bit of an ordeal. So I won’t be in a position to fix things up until I get back stateside next week. Meanwhile, enjoy a visit vicariously. Wonderful photographs. I was there in the late 90s, so maybe it was a little more complete than your first visit, but had no interior spaces to view either, so it’s great to see the images. When I was there they had an exhibit of some items from Gaudi’s studio. The amazing part was a construction of string and weights — the skeleton of the church, upside down, with strings in tension showing where columns in compression would be. I’ve never seen anything like it — the technique or the result. Yes, quite a bit more complete than the late 90’s to the point of being consecrated by the Pope in late 2010. You can watch a video of that on their Youtube channel and also see an animation of it all coming to completion over the next dozen years. The string and weight construction was done for the proposed church which would have gone on top of the crypt of la Colònia Güell. A must see if you get back to Barcelona. It’s 8 miles SSW of la Sagrada Família on the other side of the Llobregat. The turtle you show in your Flickr set is of course, a sea turtle and it’s the downhill (towards the sea) one of two, the other being a land tortoise on the right (uphill) side of the door. Turtles holding up the cosmos.